Welcome pack on arrival to include Milk - Sugar - Bread - Butter - Biscuits - Tea - Coffee - Water - Wine . Drinking water and free standing cooler unit. Notebook laptop usage on request. Mountain bikes - two available on request. Air conditioning & heating units through out the villa. Two way airport transfers when car hire is arranged via our booking form. Taxi services arranged for airport transfers and quotes on Island taxi tours. All bed linen and bathroom towels supplied pool towels. Weekly bed linen and bathroom towels changeover service. Twice weekly maintenance and cleaning service to our swimming pool & spa hot tub. Arctic Spa deluxe hot tub. Mobile top of the range gas BBQ with hood oven and a Greek souvla charcoal BBQ. 55" hdmi LED TV using the latest satellite system. Sky Sports1- 2- 3- 4 - 5 + F1 + Euro Sports + Bein + BT Sports 1 - 2 - 3 channels. Bank transfer - 100.00 sterling deposit secures your holiday requested dates. Balance is payable 4 weeks prior to your arrival date. Due to reports in the media of non existing villas and bank transfer fraud, victims have fallen to an increasingly common fraud / scam where criminals hijack the details of overseas villas, or use totally fake details to dupe thousands of pounds from unsuspecting holidaymakers. We offer guests - 100 sterling deposit secures your holiday requested dates. Then CASH balance in sterling payable on arrival at the villa. wherever you go. All just a tap away. left off on any device. Our apps give you the flexibility to find a place you would like to stay. like other rental sites do. 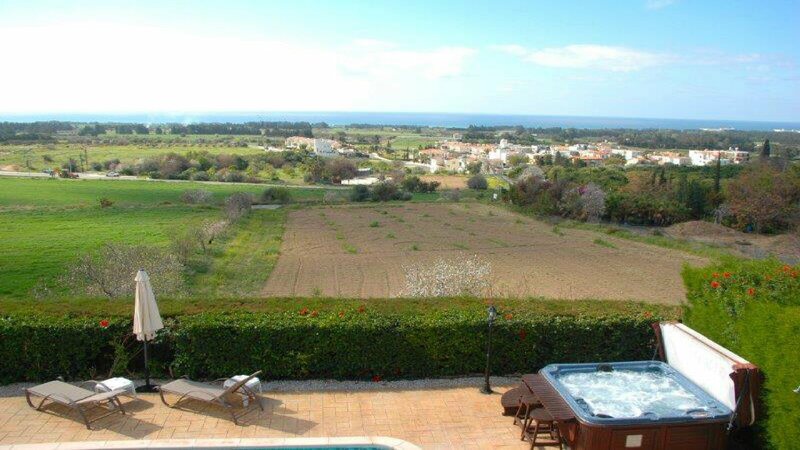 apartments and bed and breakfasts worldwide to include the Villa Hieros Kepos in Paphos. 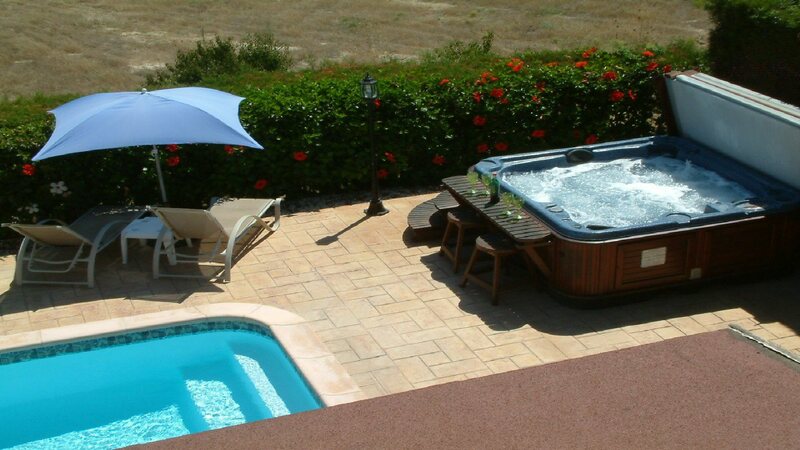 Villa rentals Cyprus in the holiday resort of Paphos. 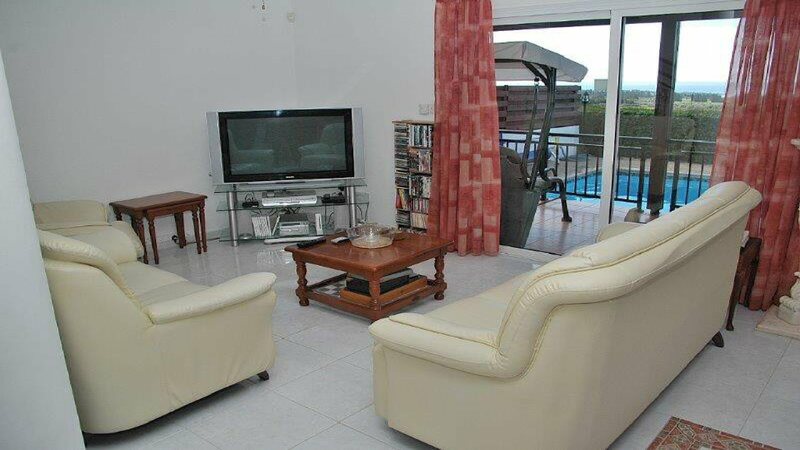 HK Villa Paphos - Rent the holiday villa Hieros Kepos comprising of full air-conditioning plus heating units fitted in all rooms. Accommodation is in 3 large double bedrooms on the first floor all having queen sized double beds, tastefully furnished and all have full en-suite facilities. Each bedroom has hair dryers, bathroom towels and all bed linen is provided. The villas sleeps up to 6 persons in comfortable and picturesque surroundings. The villas Hieros Kepos is ideally located being only a short walk into the village of Yeroskipou, Paphos, where you will find local bus services, visit various trading shops, a supermarket, a bank, post office, and of course local taverns. For the more energetic you can walk down the country lane, lined by fruit trees and orchards, onward to the sea and beaches. The local beach of Yeroskipou, known locally as Rikkos beach, is of stone-pebble and sand with good clean bathing in the sea. We do though recommend car rental for all those tourist day trips out, visiting the historic Cyprus sites of ancient years gone by and its natural history. So book your car hire, grab your Cyprus maps and enjoy the ancient historic sites of Cyprus, exploring this wonderful romantic holiday Island of Cyprus, which some still call "The Playground to the Gods". The villas owners John and Ann pride themselves on strict management policies, ensuring the holiday villa is maintained and cleaned to a very high standard. The villa is operated and maintained by the family who have many years of experience in the hotel and hospitality service industry in Whitby, North Yorkshire, UK, knowing the qualities required to provide you with that personal service with the aim of total client satisfaction, making for that perfect holiday in HK Villa Paphos for you and your family. 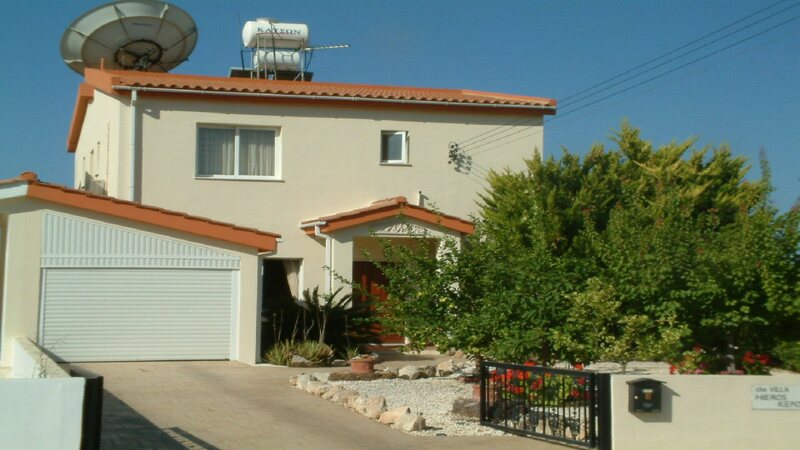 John and Ann had the villa built in the village of Koloni, Yeroskipou, a beautiful part of the Paphos resort region. Rent this detached holiday villa from the owners offering you a quiet and relaxed holiday of tranquillity but having all the local atmosphere and local culture thrown in. The villas owners John & Ann, offer you the Villa Hieros Kepos, a detached private holiday villa having its own gas heated swimming pool, spa hot tub, shaded veranda with swing hammock, plus a gas and a charcoal bbq`s all having fantastic panoramic sea views and sunsets when renting your villa holidays this year in the HK Villa Paphos. There are many family villa holiday activities here in Cyprus catering for all ages and with the freedom you have when you rent your own private holiday villas and renting your car hire you can explore the island in your own time at your own pace and leisure. 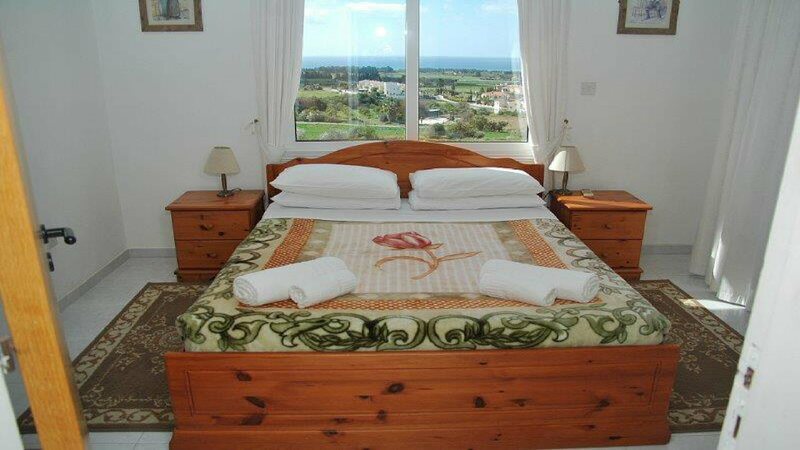 Golf holidays and golf breaks staying in golfing villas in Cyprus has become very popular. All Paphos golf courses are PGA level Golf Clubs, the Elea Estate Golf Club - Aphrodite Hills Golf Club - Secret Valley Golf Club - Tsada Golf Club - Minthis Hills Golf Club are only a short drive from the holiday villa Hieros Kepos. The new golf club and course named Elea Estates, designed by Sir Nick Faldo and is just a few minutes short drive from the villa. The course is now open for the golfing enthusiast, having a super restaurant open to the general public. So get your golf clubs, load your golf trolley, grab a hand full of golf balls and have a great golfing holiday in the Cyprus sunshine when renting a holiday villas in Paphos.